Satan's Blood Pepper Extract, 1.35oz. Satan's Blood Hot Sauce (1.35 FL.OZ. 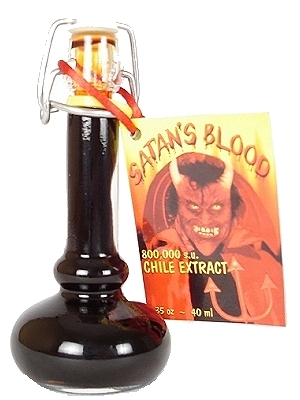 / 40 ml): Blood vial shaped bottle with 800,000 Scoville units of pepper extract. Conceived on Friday the 13th in October 2000, during a full moon. This is a must-have collectible. Ingredients: Chile Extract and Red Wine Vinegar Brand: Satan's Blood Hot Sauce Awards: First Place Winner of the 2002 Scovie Awards for packaging.